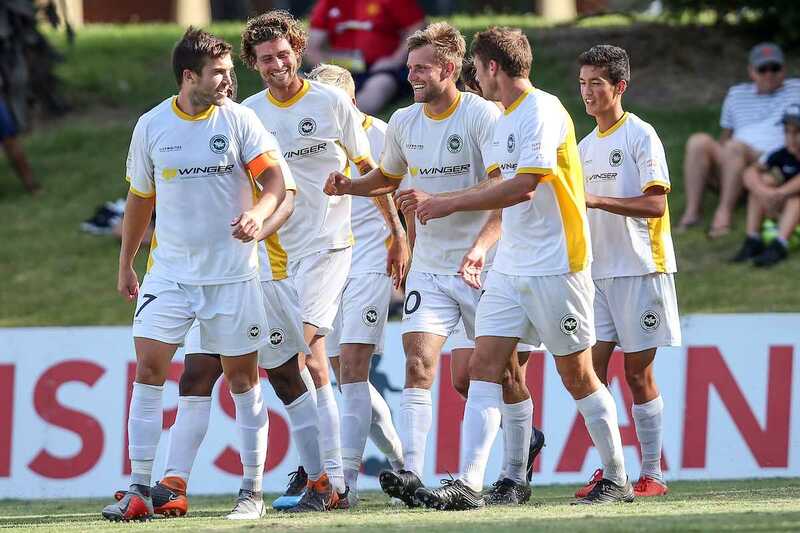 Defending champions Auckland City and Eastern Suburbs have continued to set the pace at the top of the ISPS Handa Premiership while last year’s runners-up, Team Wellington, returned to winning ways in the latest bout of action this weekend. Also celebrating a victory was Southern United while Tasman United and the Wellington Phoenix Reserves fought out a draw. In the only match to take on Saturday, Auckland extended their remarkable winning run to 13 games by edging out fellow title contenders Canterbury United in Christchurch, substitute Maro Bonsu-Maro notching the match-winner mid-way through the second half. That put pressure on Suburbs and Wellington to respond in kind this afternoon and both duly obliged, the men from the capital sweeping aside Hawke’s Bay United 6-3 in an action-packed encounter in Napier while Suburbs also went goal crazy with a 5-1 triumph over 10-man Hamilton Wanderers at home. With Suburbs having suffered a defeat to Auckland City the week before and Hamilton needing the points to keep their play-off hopes burning brightly, the play was expected to be closely contested at Riverhills Park but Suburbs cruised to victory in the end and Hamilton had largely themselves to blame for much of that. Knowing they would be without the ball for long periods in the face of Suburbs’ possession-based style, Wanderers could not afford to go a man down but that’s exactly what happened with the score locked at nil-all when Jordan Shaw picked up a second booking to receive his marching orders. That came just past the half-hour mark, leaving Hamilton with nearly an hour to try to frustrate the hosts. Remarkably, they were given a boost in that regard when Tim Payne was ruled to have nudged Tommy Semmy in the box and Martin Bueno stepped up to coolly convert the penalty and hand Wanderers a shock lead. That appeared to sting Suburbs into action though and a classy quick-fire double from Callum McCowatt put Suburbs 2-1 up by the break. Also highlighting his potential was fellow talented teen Elijah Just, who joined McCowatt in notching a brace in the second half while All White Andre de Jong took his goal tally to 11 with a well-timed volley. Just’s first goal was of a particularly high quality with some lovely interplay between McCowatt and de Jong releasing the youngster to finish with aplomb. “It was a fun game to play in, the red card early on made it easier for us but we stuck to the game plan and we were happy to score five,” said McCowatt, who wasn’t unduly concerned when his side went behind. Despite the win, Suburbs have a fight on their hands to secure second after Team Wellington bounced back from a mid-season form slump with a high-scoring victory at Hawke’s Bay. Most of the damage was done in the first half as goals from former All White Aaron Clapham, Angus Kilkolly, Jack-Henry Sinclair and Andrew Bevin put the visitors well in control at 4-1 up. Clapham added his second early in the second half and Ross Allen made it six from the spot late on while golden boot leader Sam Mason-Smith, Cory Chettleburgh and Maxime Oliveri replied for the Bay, whose own hopes of making the play-offs are now surely over for another season. The margin of victory was far tighter in Dunedin but Southern won’t care after carving out their fifth win of the campaign to rise within seven points of the play-off spots. The home side fell behind to Waitakere near the end of the first half when Andrew Abba found the net from a tight angle but Conor McDonald equalised 15 minutes after the restart with a goal on debut. The game then really began to open up and Southern took a lead they wouldn’t relinquish when Garbhan Coughlan was brought down by Waitakere goalkeeper Nick Draper and dusted himself off to slot home the resulting spot kick. Southern are now dark horses to sneak into the title reckoning as they have a game in hand on fourth-placed Canterbury. Tasman are well out of the running in third from bottom but continued their recent revival with a draw that extends their unbeaten run to four games. The visitors took the lead against cellar dwellers the Wellington Phoenix Reserves when Kiernan Hughes-Mason prodded home from close range after a corner but the ‘WeeNix’ picked up just their fourth point of the season through a late equaliser from Benjamin Waine. The Phoenix don’t have to wait long to build on that as they will be in action again on Waitangi Day this Wednesday against Team Wellington in the local ‘Wel Clasico’ derby.